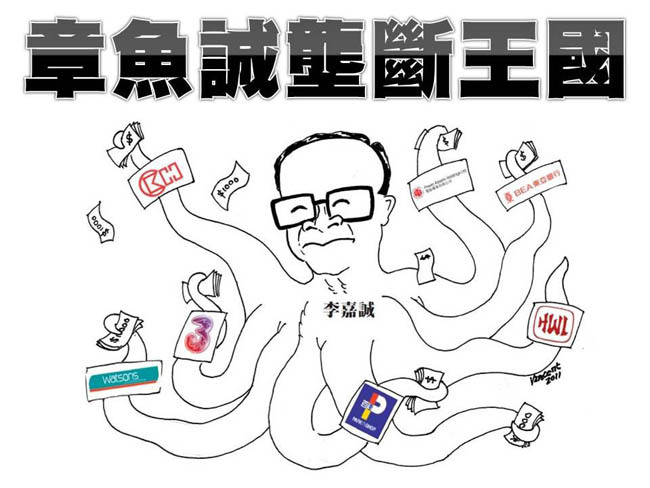 In Hong Kong it is the tycoons like Li Ka-shing that rule. The inspiring month-long port strike has illuminated this fact clearly, opening the eyes of more and more people. Six tycoon-owned conglomerates dominate Hong Kong’s economy, swallowing at least 23 cents in every dollar spent, including 90 percent of its supermarket sales and two-thirds of its private housing market according to the Wall Street Journal. These business empires stretch across all sectors – you cannot take a bus ride, shop in a mall, make a phone call, stay in a hotel, watch a movie, or light up your home, never mind buy an apartment, without making these tycoon families even wealthier. This is where the term ‘property hegemony’ comes from, given that these tycoon clans between them control the property market including commercial rent levels, which turns small businesses into slaves of the tycoons. At the apex of this power structure is Li Ka-shing, the world’s eighth richest man, with a personal fortune valued at US$31 billion (HK$241 billion) according to Forbes magazine. He owns companies that make up 15 percent of the stock market (measured by the total value of shares). Last year, Li and Hong Kong’s other billionaires did very well. Li’s fortune rose by US$8 billion (HK$62 billion). To put this into perspective, the increase in Li Ka-shing’s wealth over the past 12 months is almost enough money to finance Hong Kong’s education budget for a year (HK$63 billion) and almost equals what the Hong Kong government made from land sales last year (HK$69 billion). Other tycoons also did well, if not quite as well as Li. Henderson chief Lee Shau-kee increased his personal worth by HK$23 billion last year, to HK155 billion. Serious corruption charges and a family feud did not stop the Kwok brothers increasing their wealth by HK$31 billion last year (source: Forbes list). For Hong Kong’s masses it is a different story. The wealth gap is now the most extreme in any developed economy. Poverty has become “endemic” in the city according to the Hong Kong Council for Social Services (HKCSS). For the first time there are over 300,000 elderly people living below the poverty line – the number is 305,000. According to economist Andy Xie, Hong Kong’s average wages have only risen 1.5 percent per year in the past decade, below the rate of inflation. The story of the ‘self-made man’ is a myth of capitalism. Rather than self-made, Li’s money has been made by exploiting the labour of others. He has also been hugely favoured by the state, in a so-called ‘crony’ relationship, receiving special treatment and protection. 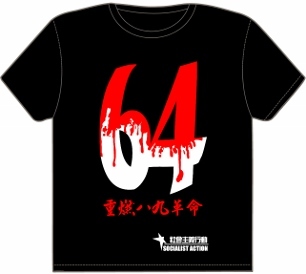 This occurred first under the British colonial government, and then under the CCP (Chinese Communist Party) dictatorship and its Hong Kong minions. Li’s property conglomerate Cheung Kong Holdings, established in 1972, is the second largest in Hong Kong and built one in seven homes in the city. Li Ka-shing built Cheung Kong by engaging in a speculative property-buying spree in the aftermath of the Maoist-influenced riots of 1967. Cheung Kong was then given the go ahead by the British to branch into utilities, acquiring Hutchison Whampao in 1979, which controls the port of Hong Kong, and Hong Kong Electric Holdings in 1985, the city’s second largest power company. This was a springboard into other economic sectors such as retailing, telecom and media. Li’s A. S. Watson Group has over 7,800 stores, which includes Park’n’Shop supermarkets (250 stores in Hong Kong and 50 in mainland China) and includes other brands such as Taste and Fortress. Li Ka-shing’s expansion into utilities and infrastructure was facilitated by the shift to neo-liberal policies worldwide in the late 1970s, especially in Britain which ruled Hong Kong. Without government help, Li and his sons might still be selling plastic flowers from a box on the street. Neo-liberalism claims that state-run industries are ‘inefficient’, and wants as much as possible – water, energy, transportation, schools, hospitals, even prisons – privatized to be run by private capitalists at a profit. Tycoons like Li and his international counterparts have been influential figures in getting the politicians to adopt radical neo-liberal policies of privatization, de-regulation (which increases profits but reduces service quality and protection for consumers) and outsourcing (which is used to impose ’sweatshop’ conditions upon workers and weaken union bargaining power – as we have seen in the port industry among others). But while neo-liberalism denounces welfare and government support for the needy, the tycoons are coddled by government policies including favourable access to land, super-low taxes, tolerance towards cartels (price-fixing agreements between big companies to manipulate the market). So Hong Kong is a classical example of ‘cronyism’ i.e. government-business collusion, which shatters the myth spread by right-wing think-tanks that Hong Kong is the ‘freest’ economy in the world. Liberal economists officially frown on this sort of thing, but the truth is there is no capitalist economy anywhere in the world without ‘crony’ relationships. When Leung Chun-ying was ‘elected’ Hong Kong’s leader he made some noises about challenging the big tycoons (who mostly backed his rival Henry Tang Ying-yen) and especially to reduce their stranglehold over the housing market with a promise to build more public housing. But this has not happened. Tycoons with Li Ka-shing to the fore, helped by their friends in Beijing, have pressured Leung to toe the line and moderate his public housing plans in particular. 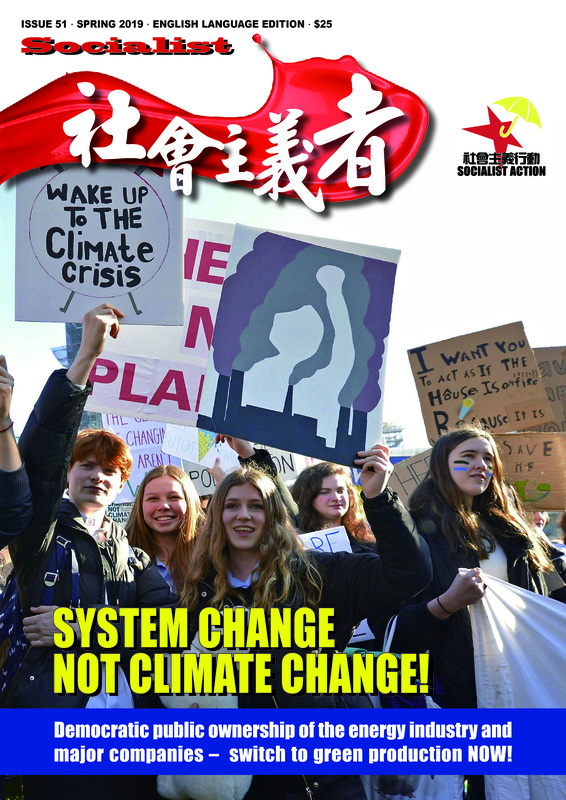 Hong Kong capitalism is a ‘mature’ capitalism meaning its economy is almost completely parasitic, based on making money from money rather than from the production of goods that people can use or consume. Most of Hong Kong’s profits are made outside its borders, especially from sweatshop labour in mainland China. Today, fantastic sums of money are made from financial speculation, creating a housing nightmare even for the middle-class, and the massive human rights violation of 250,000 people forced to live in small subdivided flats and cages. But given the limits of a small domestic market there is a “surplus of capital” as Lenin explained, which leads the capitalists to expand overseas. Li Ka-shing is a textbook example of this phenomenon. Li’s companies own a network of ports, telecoms, media interests and utilities employing 250,000 employees around the world. He controls 13 percent of all container port capacity in the world, operating ports in nearly 30 countries. Li’s port operator Hutchison Port Holdings, part of Hutchison Whampao, has also entered into partnerships with Chinese government-owned companies including the ports in Shenzhen. Li’s investments in China go far beyond this, with major construction projects in big cities including Beijing. Prior to the Chinese New Year, 100 construction workers in Jilin province staged street protests demanding 20 million yuan in unpaid wages at a luxury residential complex owned by Hutchison Whampao. Hong Kong’s tycoons were quick to embrace the CCP dictatorship as a good bet once Deng’s capitalist reforms got underway, and the tycoon families now have several representatives ‘elected’ to the quasi-governmental NPC and CPPCC, including Li’s son Victor Li Tzar-kuoi. The debt crisis in Europe made that continent a particular target for Li Ka-shing’s acquisitions, buying privatized utilities, energy companies and telecoms. Hutchison Whampao now derives 42 percent of its revenue from Europe. “European companies are becoming the new darling of Li Ka-shing”, exclaimed one financial analyst. Li’s recent acquisitions include Wales & West Utilities, which provides gas to one quarter of Britain’s population (other Li-owned British utilities include UK Power Networks, Northern Gas Networks, and Southern Water). Last year, Hutchison paid 2 billion euros for a stake in Irish phone company Eircom, and 1.3 billion euros for Orange Austria, another telecom. Li’s Watson Group owns the Superdrug chain with over 900 stores in Britain and Ireland. 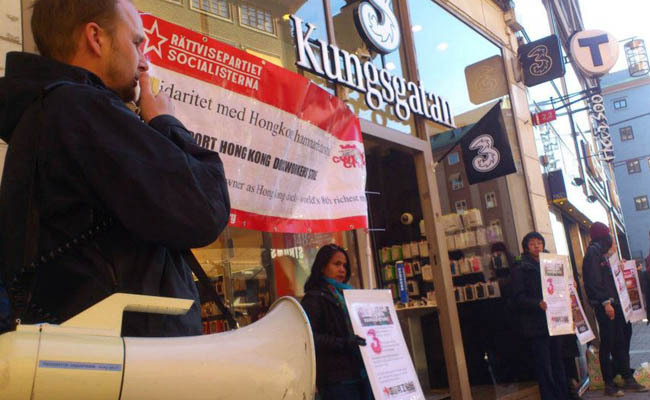 Socialist Action in Hong Kong, allied with the Committee for a Workers’ International (CWI), supports the Hong Kong dockworkers’ struggle for a living wage. In discussions with striking dockworkers and also with socialists around the world, through the CWI, we give assistance to this struggle and campaign for worldwide solidarity action. 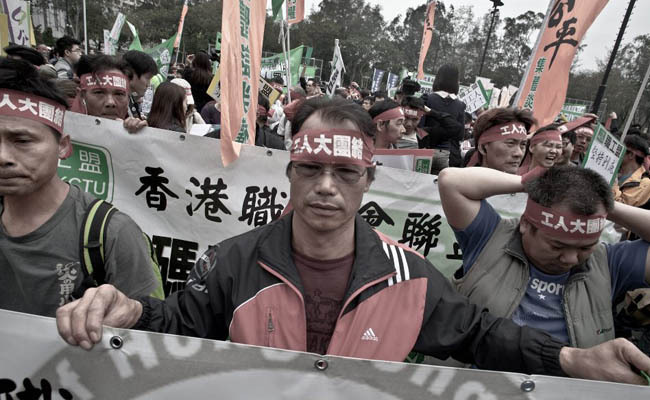 Following examples of workers’ struggles in other countries, such as last years’ dockworkers’ strike in Portugal, we have put forward the idea of a worldwide protest strike by port workers in solidarity with their Hong Kong brothers. This call could particularly be raised with unions at the many ports owned by Li Ka-shing’s Hutchison, which includes Alexandria, Brisbane, Buenos Aires, Jakarta, Karachi, London, Rotterdam and Sydney. Let the rich pay for the crisis – for a wealth tax on the tycoons and an end to Hong Kong’s super-low corporate tax rate! Abolish outsourcing and contract labour – for real jobs and increases in wage levels to compensate for inflation! Build fighting unions and a new working class party! For internationalism, solidarity and opposition to all forms of racism and ethnic discrimination! For an emergency public housing plan to construct at least 50,000 new low-cost units every year – kick out the tycoons and take the banks and construction industry into democratic public ownership! Break up the capitalist cartels and end property hegemony! The only way to do this is by nationalizing Cheung Kong Holdings, Hutchison Whampao and other tycoon-owned companies and placing them under democratic control and management by workers and the public.